The last few months of 2017 weren’t all that kind to your old pal. The TL;DR version is this: Lousy gig, terrible holidays, DEPRESSION, and a general sense of low self-worth. However, that doesn’t mean I haven’t been keeping myself busy. Far from it. Not only have I completed another novel (currently in the first round of edits), but I’ve written several new short stories that I hope to unleash upon the innocent and the righteous as soon as possible. One short story though? Well, it’s been hanging around for a while now, mocking me at every turn with how great it is. And YET…I still haven’t found a home for it. Did that sound arrogant and douchey enough? I wrote ‘Godkiller’ back in 2015 give or take. The concept, rather MOST of the concept, came to me in a dream. This was back when I was having these beautiful, complex vivid dreams on the reg. Sadly, as my depression worsened, I started back up on antidepressants and the vivid dreams have dropped off significantly. So it goes. The part of the dream that became the basis for ‘Godkiller’ involved myself exiting some odd convention through a door only to find myself somewhere else entirely. A barren wasteland with rolling hills of dying or dead grass and little else save for a dilapidated shack off in the distance. As I wandered to the shack, I realized that I was being followed by someone. Someone big. I couldn’t see this person’s face or anything else about them, but I knew they were coming to kill me. I hid in the shack, doing my best to barricade myself inside but my giant pursuer would not be denied. He tore through the wall of the shack as if it were naught but air. As the giant produced a machine gun— an Uzi to be precise— and cut me to pieces with it, I woke up. I did what I always do when I have such a dream: I went straight to my Idea Notebook and scribbled the idea down to be written at a later date. That later date came much sooner than I thought and soon the story was done and I was shopping it around. Despite a couple of near-misses and overwhelmingly positive feedback from my writing group and other colleagues I shared the tale with, ‘Godkiller’ remained homeless. Unloved and unread. That changes today. 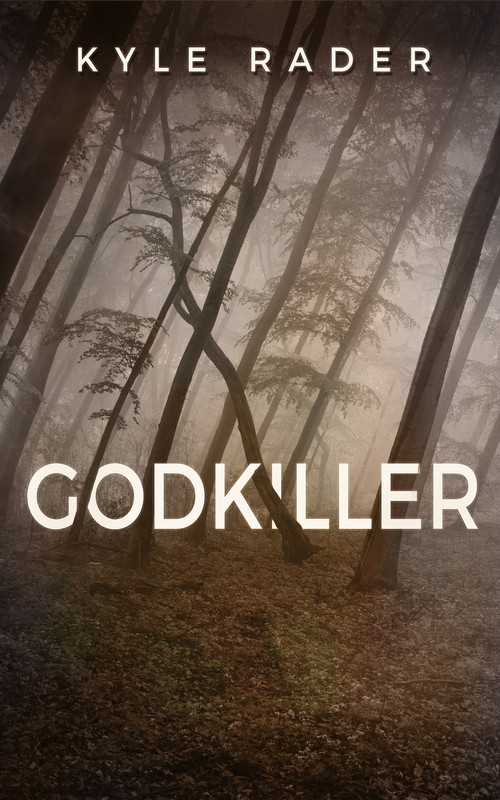 I am diving into the world of Kindle Direct Publishing and releasing ‘Godkiller’ for immediate sale today! Don’t have a Kindle? No problem! You can download the Kindle app for your PC or Mac. Hell, you can even get it for your phone! It’s a brave new world! I hope you’ll take the time and spend your hard-earned cash on my little tale. It’s a nasty, bleak one and I’m ever-so-proud of myself for it. Check it out here!